Rita, thank you for this delightful review. I have only recently read N&S because my GoodReads friends kept talking about it and were aghast when they learned I had NEVER read it. I soon took care of that. I would love to win this. A side note… that guy on the cover looks just like my father did when he was much younger. It made me want to say… Hello Dad! Oh, and if your father looked like Mr. Thornton he must have been a dashing young man!! I have yet to ‘dip my toe’ into the North and South fan fiction, but knowing how wonderfully Ms. Clarkston wrote her JAFF and your praiseworthy review, I think I will! Thank you for the chance to win the book! I love North & South and have struggled to find well written fan fiction for it. This sounds great and I look forward to reading! There are 2 very good North and South authors that I know of Darcybennett and one of them is Nicole Clarkston. Like you I struggle to find good variations so when i find a good author, I’ll read everything from her/him. Wondering and we’ll-written review, Rita! This book will always hold a special place for me too. It was the first one of Nicole’s that I had read. I was searching for N&S fan fiction when I discovered. Thrilled, is putting my reaction mildly! I loved the book! I agree with your assessment completely! I’ve loved her other books too, P&P and N&S. She has a style of writing that captures the essence of the original stories and their characters. Glad you like the new cover, too. It was fun to do and was enjoyable to work with Nicole. No need to enter me in the giveaway as I already have the book! That first word was supposed to be ‘Wonderful’. I should never do these comments on my phone. Ugh! I can safely say that a Nicole Clarkson book is a must have. I’m dying to read this now. I try to work in a bit of sea travel in almost every story I have knocking around in my head, so the thought of all that Margaret/Thornton angst trapped on a ship on the middle of sea sounds…delicious! What a lovely review, Rita! Thank you so much for featuring my book. 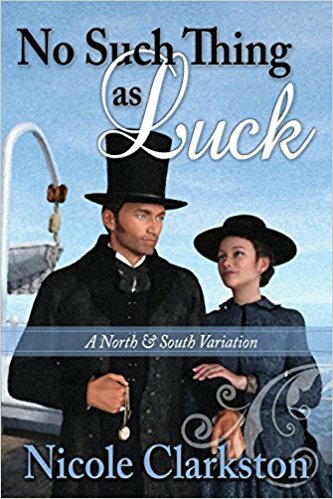 This one opened the door to a lot of amazing people for me, and I am grateful to have met so many wonderful fans of North and South through it. Thank you everyone, for your kind comments, and a huge thanks to Janet Taylor for giving this book a much-needed facelift! My pleasure Nicole! I hope you can continue to write North and South fan fic as I desperately need more good books with John Thornton! I haven’t read too many N&S fanfictions but this sounds so good!! I’d love to read this. Thanks for the review and giveaway. This is a very good one Priscilla, and I think this is one that P&P readers will like due to its similarities. Good luck in the giveaway! To read of the slow burn romance,light yet lingering touches brought a smile to my face and gladdened my heart! I have to mention that I just love this new cover,one that cannot fail to do justice to the John and Margaret that reside in our hearts and minds! Well done Janet,another book cover to be immensely proud of! Please don’t include me in the draw as I’ve read and loved this sublime piece of writing. Nicole is indeed a marvelous writer, Northern Rain is also a masterpiece, have you read that one as well? Thanks to m Nicole writing No Such Thing as Luck and Northern Rain, both of which I loved, I am finally listening to North and South. Don’t enter me in the giveaway, Rita, as I already have this book on my Kindle and also as an audiobook. I’ve recently finished listening to Northern Rain and if NSTaL is anywhere near as good as that, then it must be amazing! Just popping by to say how much I loved this book (please don’t enter me in the giveaway, read it, loved it, re-read it, can’t wait to go back to it). A wonderful story in every way! Hope you have more like this up your sleeve, Nicole! I could not understand this sudden fascination with North and South as I was thinking of the John Jakes saga from the early 80’s. I kept wondering how that series could possibly tie to JAFF. And then I learned what it really was and last week, while the family was away, I caught up. And now I may just have to start North and South FF. Thanks for telling me about this book! I’m sure you’ll like it, North & South is different in may aspects from P&P, but the love story is actually quite similar, and John Thornton just as amazing as Mr. Darcy. I’m sure that if you’ll watch the BBC adaptation, you’ll want to read N&S fan fic. I’m one of those people, Rita! That’s almost certainly why I missed the BBC dramatisation when it was first broadcast. It then took me nine or ten years to realise my mistake and I only found that out because I got involved in the JAFF community. Folk were also mentioning N&S and a certain Mr. A. and his performance as John Thornton. My memory of North and South featured Patrick Swayze’s performance as Orry Main and I couldn’t reconcile the two. A little research online showed me the error of my ways, and the rest is history! I must read this one day… I will, I will. Thank you for great review. Nicole is such a lovely writer! I’ve never read a single N&SFF, time to change that wouldn’t you say?! This one promises a gread read and I’d love the chance to find out what happens myself. I can never stop recommending N&S fan fic to P&P readers Charlotte, so I really believe you would like it! I love North and South. This variation sounds wonderful! This new cover is beautiful! Janet did a great job with it. North and South is one of my favorites!! Good luck in the giveaway Anglophile! I have read and reviewed all of Nicole’s books and must say I enjoyed them very much. North and South is one of my favorite books along with P&P and Outlander in my twilight years.